Quantum Meditations were channeled from January 2011 to January 2012. Over 2,400 meditations were channeled during that period. though they are a great source of light and inspiration for many. either as word compositions or as poster images. There are currently 6 print editions of Quantum Meditations and 10 ebook editions. In addition, we have recently published a print edition of The Complete Quantum Meditations. It counts over 800 pages in a large format. No complete ebook addition will follow. You can find a complete list of all kindle and print editions at Amazon. The first six ebook volumes are also available in epub editions at Kobo and elsewhere. 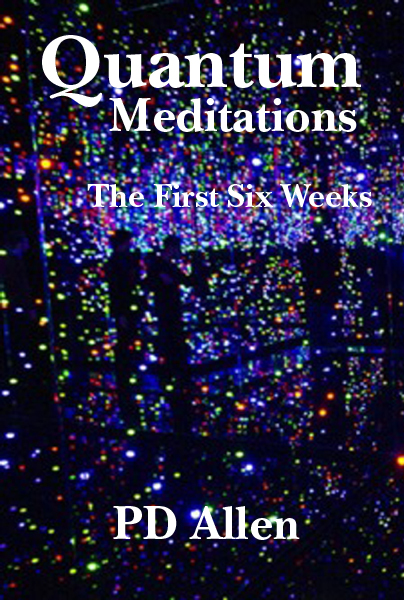 In addition, there is a free edition of Quantum Meditations; the First Six Weeks. It can be found at the following locations. This book can also be found in kindle and other formats at Smashwords.